Surgical robots systems are found in most operating environments and are deployed in a wide range of surgical domains including orthopedics, neurosurgery, radio surgery, and interventional oncology. They are used for telemanipulation of laparoscopic interventions in general as well as specialist urological, gynecological, and ophthalmic surgery. The principle purpose of surgical robots is to augment the capabilities of the surgeon beyond human sensing and tactile faculties, thereby increasing accuracy. The level of autonomy with which the robot can deliver this improved accuracy (no autonomy, robot assistance, task autonomy, conditional autonomy, high autonomy and full automation) relates directly to the surgical procedure the technology is designed to address. In the case of inner ear surgery, conventional microsurgical interventions take place at the limits of the visuo-tactile capacities of the manually operating surgeon. Cochlear implantation is an otologic microsurgery procedure in which a hearing assist device is implanted into the hearing end-organ, by placing a silicone wire with platinum electrodes into the cochlea. Worldwide around 65,000 cochlear implants are received by patients annually. Research in the Surgical Robotics group at the ARTORG Center has led to the development of a dedicated, image-guided, safety-assured, task autonomous surgical robot for cochlear implantation. 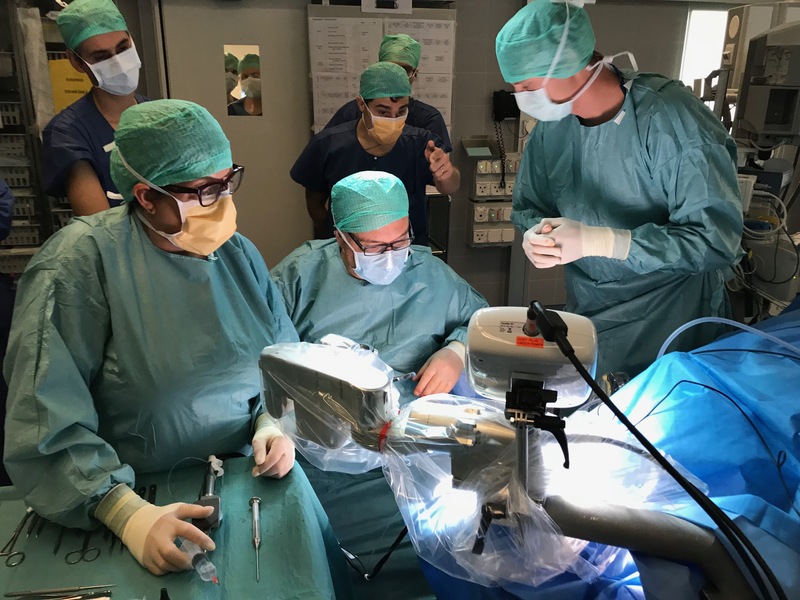 The robotic cochlear implantation project has been translated into the hands of surgeons and in a clinical trial 5 patients have been implanted so far using robotic technology. CAScination and MED-EL GmbH have accessed the technology commercially and a cochlear implant robot product - HEARO®, is undergoing regulatory approval. Plans for the HEARO® technology going forward include paediatric applications and other uses in ENT surgery.